Angelwish.org was created in 1999 with the mission to provide the public with an easy way to grant wishes to the millions of children that are living with chronic illnesses around the world. Angelwish achieves its mission by ensuring that 100% of individual donations are used for program services and that those funds are extended, where possible, to incorporate an educational component giving young people a hands on lesson in philanthropy. Angelwish is a registered 501(c)3 charitable organization in the United States and is Registered Charity No. 1141090 in the United Kingdom. 1. Online Birthday and Holiday Wish Granting Angelwish pioneered the concept of digital philanthropy, engaging the public to provide critical psychosocial and educational support for children and adolescents living with chronic illnesses all over the world. 2. International Giving Angelwish offers donors the opportunity to support over 9 programs overseas, where monetary contributions have the greatest impact. Angelwish collects these funds from the public and redistributes 100% of the money to the partner organization to use for medical, nutritional, and educational purposes. 3. Angelwish Holiday Toy Drive Angelwish operates the physical distribution of toys donated by the Today Show Charitable Foundation. Though our roots are in online fulfillment of wishes, Angelwish is able to support our core values by reaching more children and encouraging civic engagement as a result of this drive. 4. Angelwish Students Give Back Program Angelwish has developed a curriculum for grade school children on Angelwish Giving Sprees at various toy stores or bookstores, talking to them about children living with chronic illnesses all over the country, and then asking them to select toys for those children using our money to pay for the items. 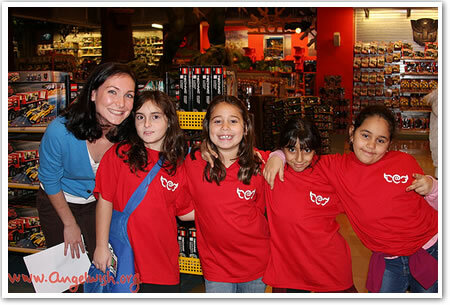 Participating children go on to associate giving back with something fun. 5. Angelwish Educational Support Angelwish believes that there is a gap in support to at risk children with chronic illnesses and that our network and services can have an even greater impact on the educational opportunities for children.